I’ve been in Atlanta the past weekend, attending the A-Town Throwdown Stage Combat workshop. There, I learned to crack a bullwhip, throw a knife, and renewed my proficiencies in knife and single sword combat (neither a recommended pass, to my great, irksome chagrin. Turns out I still have a bruise-able ego.). As the vast majority of my time – 8am-7pm each day – was spent on the Georgia Tech campus studying fabricated violence, I had only one afternoon to enjoy being a tourist in Atlanta. Here is what I did with that time. I asked my hotel registration desk what was worth doing at 4pm on a Thursday. I heard there was an underground mall, the Civil Rights Museum, a giant aquarium – too much to do in a single afternoon that was already heading towards evening. The friendly woman at the Courtyard suggested I go see The World of Coke, as that was the most “touristy” thing I could do. Note: The World of Coke closes at 5pm, but you can still get into the World of Coke up to that point. The museum itself is open until 6:30. I showed up at 4:55pm, and they let me in. To be fair, I was very enthusiastic and sweet/hopeful. The cost of an adult ticket is around $18. The World of Coke is a glorious contradiction. It’s Disney-level gizmo and delight, sound effects and bright colors and a complete sense of “We aren’t in it for the money!” when they clearly are. I found it charming, like being around a good flirt who knows exactly what he’s doing but is pretending like he doesn’t. 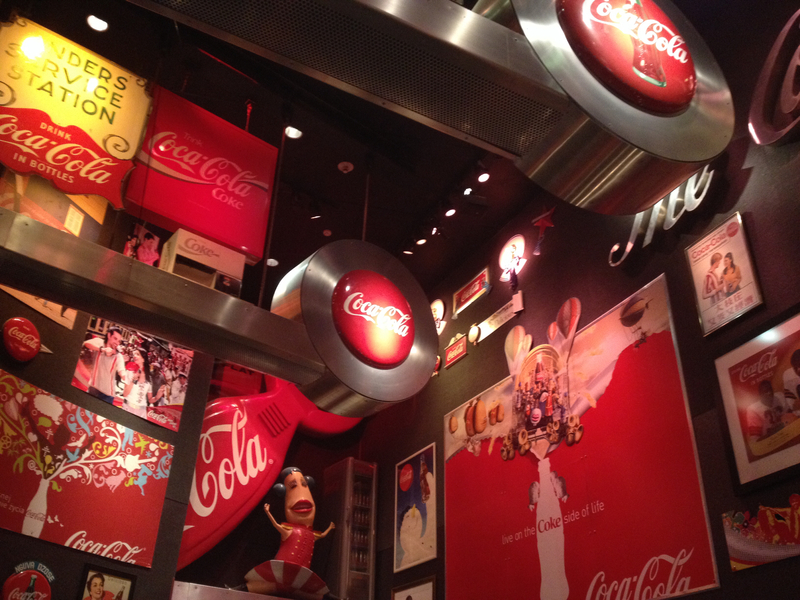 There are rooms simply packed with antiques and famous Coca-Cola products. There are happy, crisp employees who are always smiling and welcoming, despite the fact that I was part of the last group and they’ve clearly said the same dialogue a hundred times before I showed up. 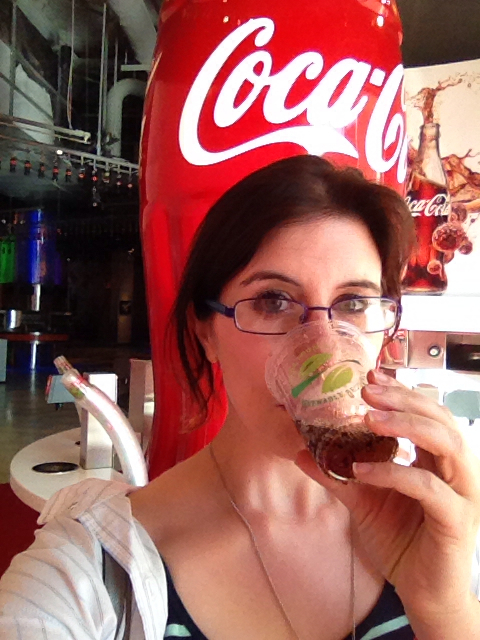 I’ll admit it – I like Coca-Cola, and I am susceptible to sentimentality. This place has both in full force. Coca-Cola: reuniting families! Coca-Cola: inspiring adventure! Coca-Cola: racially progressive! Coca-Cola: started at 5 cents a bottle, went to 6 cents after several generations, and yet somehow now costs over a dollar (i.e. the price seems to be rising steeply as of late.) But then there are actually interesting, helpful things that Coca-Cola does. They’re recycling plastic bottles into t-shirts, and composting their own waste in the park outside. It’s a genuinely nice thing to see. I was lucky to be there at closing time. Judging from the turnstiles and the roped off sections, the place seems like it could get really packed. I imagine the shiny, happy, vibe dissipates in the presence of hundreds of people. If crowds are not your thing, early morning/near closing is my recommendation. 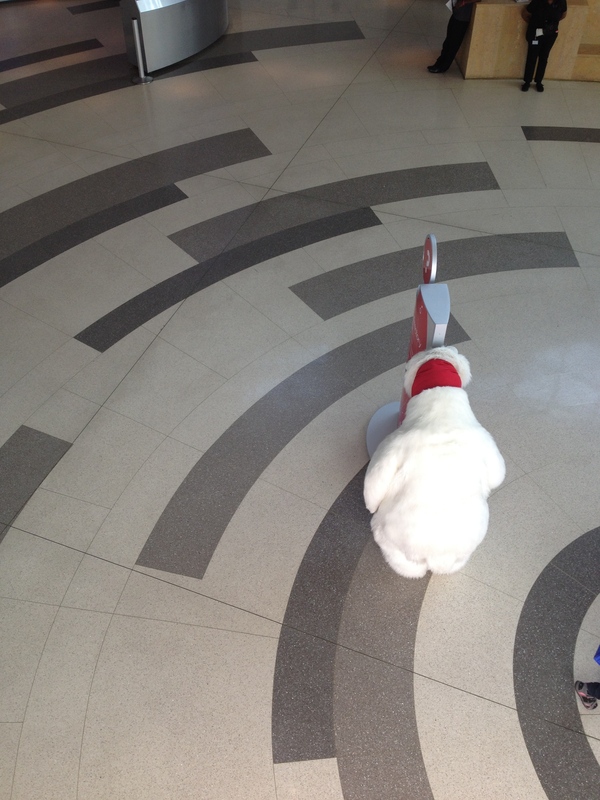 Lonely Coca-Cola Bear aimlessly pushing a sign around as the lower level begins to close. While there is no dancing fountain of Coke (which I was assured did exist at one point), there is the tasting area, with the global sodas. 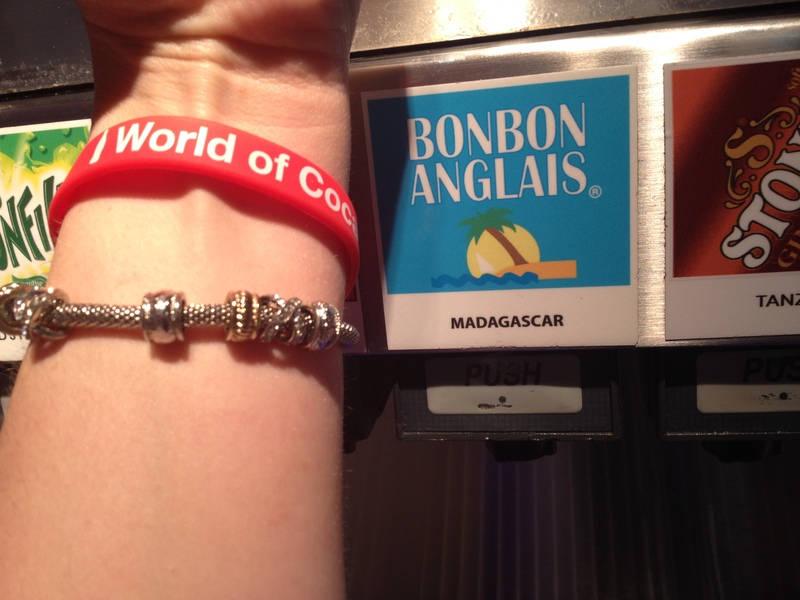 Turns out I love BonBon Anglais from Madagascar, which made me think of bananas. I also enjoyed Greece’s Pineapple Fanta. Italy’s Beverly soda was the worst, just the worst. It tasted like old boiled leather baked with expired cotton candy. I don’t know why they were pushing everyone to try it, unless it was to prove to the creators that they had made a mistake. Then you get a complimentary bottle of Coca-Cola before you hit the gift store – I mean, it was a great way to spend an hour and a half. It is a happy place – there is a sense that Coca-Cola just might be a key to fixing the human condition. I highly recommend it. From there, if you were to have a whole day instead of an afternoon, you could easily visit the Georgia Aquarium which is just across the small park. By then it was around 6:30 and the aquarium was closed. While waiting for my shuttle, I walked across the street to the Olympic Park, and noted the number of businesses I recognized. The CNN building is there, and the American Cancer Society. It was an impressive skyline. For dinner, I was pointed toward the South City Kitchen in Midtown. My shuttle driver, Tim, said it was a great place for soul food that wouldn’t break the bank. When I called there was an hour and change wait time, but when I arrived there was one seat left at the bar. I claimed it, and proceeded to gorge on food. Tim was correct – it was delicious. 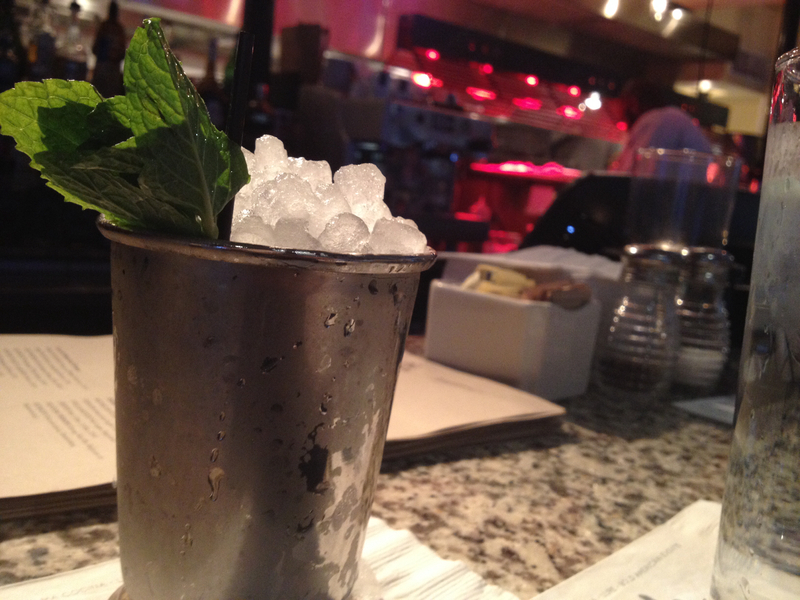 I had my first mint julep (pass – mint and whiskey and sugar did not work as I had hoped). The buttermilk fried chicken was excellent. I’m a sucker for rhubarb, and they had strawberry rhubarb hand pies. 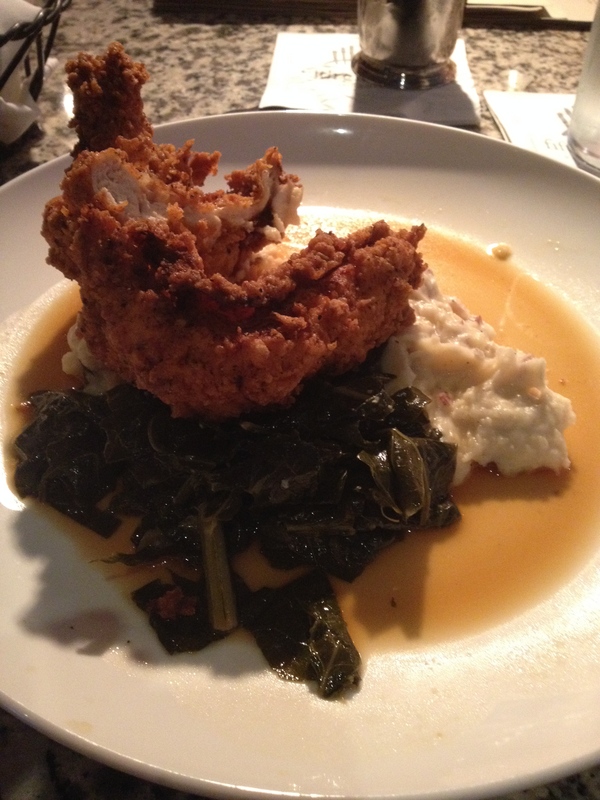 Buttermilk fried chicken, collard greens, and mashed potatoes. This kept me fed for two dinners! This Post was posted in Food, Places, Travel and tagged A-Town Throwdown, Atlanta, Atlanta Tourism, Being a Tourist, Captialism, Coca-Cola, Food, Georgia, Happiness, Soul Food, South City Kitchen, Stage Combat, Tourism, Travel, walking, World of Coke. Bookmark the permalink.